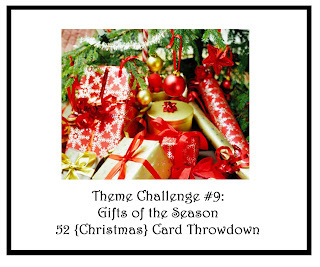 It's good morning time, as my 3 year old would say...LOL And it's time for another 52 Christmas Card Throwdown challenge and this week's challenge is a theme challenge and the theme is 'Gifts of the Season'. Once my punch art was together I started assembling my card. The presents were placed onto my embossed vanilla panel using dimensionals and the entire present panel (the chocolate chip layer) also has dimensionals under it. 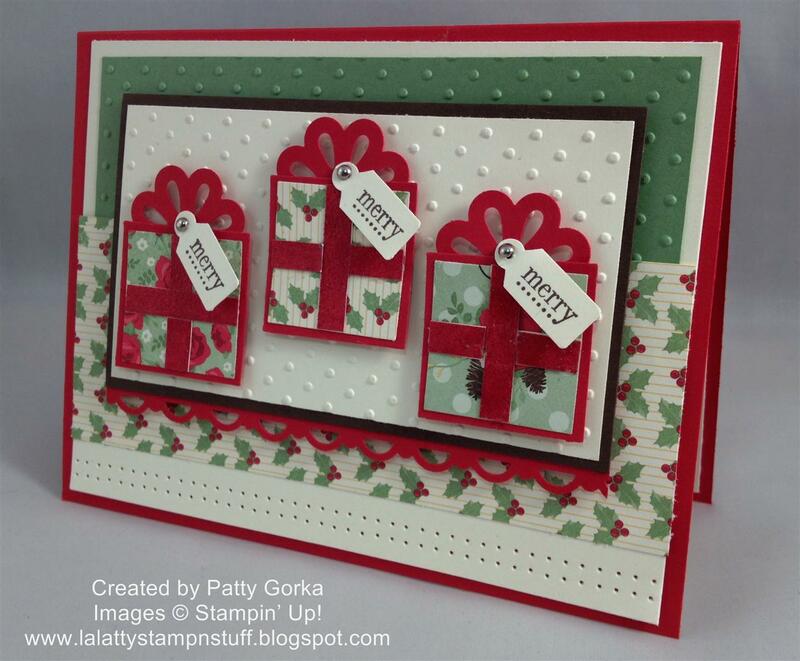 My wild wasabi (and very vanilla) layer were embossed using my big shot and perfect polka dots embossing folder. Along the bottom of my real red layer I used my scallop trim border punch and along the bottom of my very vanilla card layer I decided to add two rows of paper piercing. I love adding paper piercing to my cards because it gives a little something extra without going overboard. I hope you will play along with us this week! The 52 Christmas Card Throwdown blog is one of my very favorite challenges and this week the other design team members had some really creative card ideas! Have a great rest of the day! My son has a soccer game and soccer pictures plus we are planning to clean up the yard and close up our pool so it looks like another busy weekend for us. Patty, I love the gifts on your card! Very creative and pretty! Patty, this card is the best! The colors are perfect. You layout is amazing. The presents and details are awesome. Great job on this one!!! This card is so pretty--love the use of the punch for the bow! Great way to use that punch as a bow - nicely done! What a perfect card dor the challenge! Patty, this card is so pretty! Are you enjoying the design team? I love this card. It's great! Those presents are so cute.